I finished machine quilting and binding this beauty last night. This is a very fat quarter friendly project. One fat quarter does one zigzag row with some leftover. You can see I used leftover bits on the back for a scrappy zigzag. This measures 39" square, so a nice baby quilt. 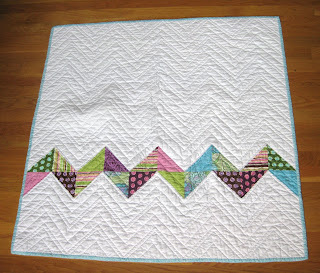 I lovelovelovelovelove how the quilting came out on this one!! This is lovely! How large were the triangles you used? Thanks! I made the triangles by using 5 inch squares - that yields two triangles. 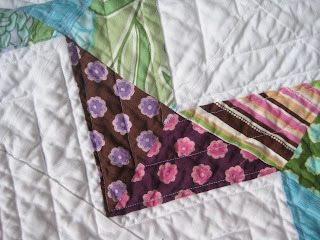 You can find the tutorial I used at http://parkcitygirl.blogspot.com and search for zigzag quilt along. I love this one! 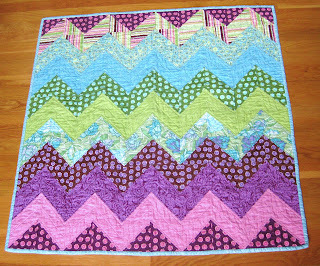 It's one of the nicest zigzag quilts I've seen. Love the back too. I think I like the back as much as the front. Absolutely beautiful!